A few years ago, I was delighted when friends gifted me with a CD of sacred music by a religious community that I’d never heard of before, The Benedictines of Mary, Queen of Apostles. It was their first album, privately recorded, and self-released, yet I was quickly taken by these gentle, prayerful voices and soothing harmonies. It seems this otherwise hidden community of cloistered women is making waves. A few weeks ago, while driving home from work late one night, I turned on the classical radio station to hear not an orchestra, but angelic female voices. I thought they sounded familiar. Sure enough! 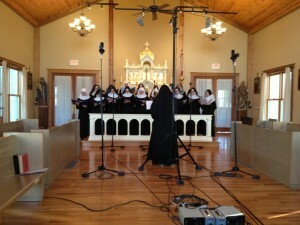 A peek at the station’s website revealed that I was hearing the Benedictine sisters’ new album! Each track is pure delight, an enchanting variety of chant with both familiar and obscure hymn melodies in rich layers of harmony. Everything is sung without instrumental accompaniment – the purest yet most challenging form of choral music. Almost no wonder that at the time of this review, Advent at Ephesus is currently number six on the holiday music sales chart at Amazon.com, competing with big-name secular artists! I have often tried to explain to my choirs that the unity of our efforts will show the ability to breathe and sing with one heart, one expression. I now have a perfect example to demonstrate for my students what I mean. Though I have never met in person the Benedictines of Mary, Queen of Apostles, I know from their perfectly united voices that they are of one heart and mind. How many professional a cappella ensembles do you know who not only sing together, but pray in song together eight times a day? This lends a mesmerizing quality to their sound that not even highly trained voices can usually attain. I now have a new favorite CD that I will look forward to replaying every year at Advent…and just maybe, some of the time in between too. Claire Halbur lives in Joliet, IL and is a Liturgical Music Director, Suzuki violin and piano teacher, choral conductor for children and adults, and vocal performer. She is an aficionado of chant and polyphony, and also enjoys graphic design and creative catechesis. She is a speaker/lecturer on topics of chastity and Theology of the Body, and has been blessed with ten godchildren whom she dearly loves.